The Brain Repair and Integrative Neuroscience Program (BRaIN) draws upon the world-class research performed by its basic neuroscientists, neurologists, ophthalmologists, psychiatrists, neurosurgeons and population health/evaluative researchers at the McGill University Health Centre (MUHC). The Program facilitates multidisciplinary collaboration by consolidating its members’ expertise within a single entity in order to advance knowledge in key priority areas. 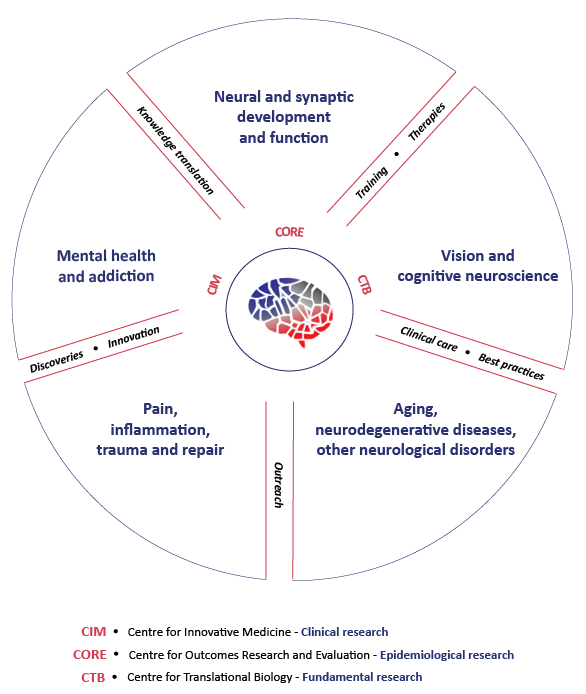 Basic, translational and evaluative research conducted within the BRaIN Program falls under the five themes illustrated in the figure above. This research aims to improve diagnosis, develop future therapies to mitigate genetic or acquired dysfunction, and synthesize and disseminate new knowledge into the health care system. Researchers in the BRaIN Program are primarily located at the Montreal General Hospital site of the MUHC, at the Montreal Neurological Institute and at the Allan Memorial Institute.